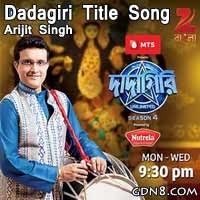 DADAGIRI Unlimited - Zee Bangla Reality Show : DADAGIRI Title Song Lyrics Sung By Arijit Singh. Dadagiri unlimited is a Zee bangla Quiz Show Program, Directed By - Subhankar Chottopaddhyay. Staring By - Sourav Ganguly. Presented By - MTS And Powred By Nutrela.